Perhaps an Art History class on a Monday at 8 am in the morning in a dark auditorium with an instructor whose voice most often flat lines wasn’t such a bad idea. I mean after all, I’m the only one of my friends in my immediate circle who can pick out Rococo from Baroque (very useful skill in the workplace mind you), label a Greek column as Doric, Ionic or Corinthian (as every art student worth their salt should be able to), recognize that the Tower of Babel was most likely a structure called a Ziggurat, tell an Indian Buddha from a Chinese Buddha just by looking at its earlobes (confucious say I’m right on the money) advise you to take a closer look at some of that Greek Pottery before you buy it (.so you can avoid hearing ” Mommy what are those two men doing to each other?”) not confuse Manet with Monet… actually that last bit isn’t true but I figured, hey, you don’t know either so I’m pretty sure I can get away with it and a plethora of other artsy fartsy things you left brained folks probably don’t give a frog’s fat patootie about. I’m not sure I was a very good art student. At least when it came to those things which required much abstract thought. I didn’t always try to read seven layers deep into something. I’m not particulary impressed with the Mona Lisa as I think I probably should have an obligation to be and outside of a passing interest I wasn’t impressed with this painting either. I thought it was stupid. 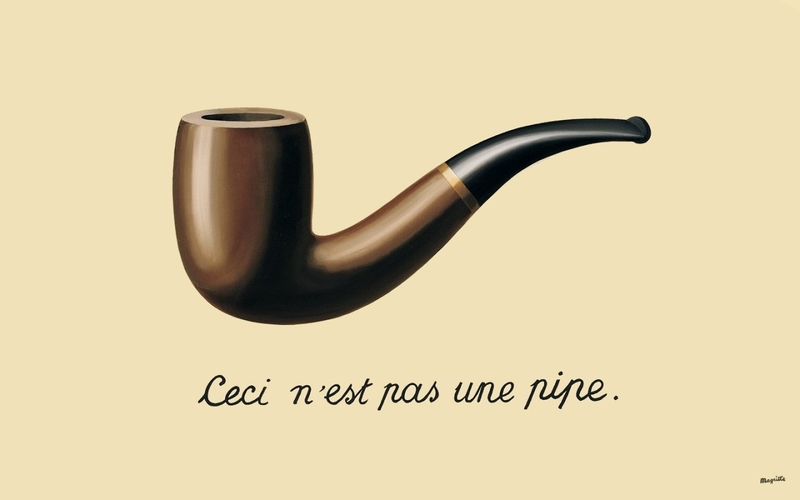 “The Treachery of Images” painted in 1929 by Belgian artist Rene Magritte often commonly referred to as ‘Ceci n’est pas une pipe” which is French for “This is not a pipe”. So now you’re scrolling back up to look at the picture because clearly…it’s a pipe. But no, Ceci n’est pas une pipe….it is a painting of a pipe. And now you’re rolling your eyes (like I did once) and affirming that artsy people are nuts and most certainly smoking that stuff and solidifying your belief that your decision to study Quantum Physics was the correct one because you…artsy chick…are wasting my time. However, here Magritte is correct of course. If this were an actual pipe you would be able to stuff it with tobacco and smoke it. Would you not? This is only a painting of a pipe, which only serves as a representation of the real thing. The words below it contradicts and causes tension and you friend,have to decide which to believe. I mean, it most certainly looks like a pipe. But which one of these is the real authority? What you see or the explanation below it. Which is stronger for you? I can’t do any justice here, nor will I try, to the Philosophical applications of this question, or the exploration of words and images in art, media, culture, community etc. etc. etc (though I wouldn’t mind…call me, let’s do lunch and discuss). I came across this painting today and it simply was a reminder to me, and perhaps now to you that you can’t always believe what you see with your eyes and that there are plenty of things in life that are counterfeit and poor substitutions for the real deal. Me…I want the real thing.